The Porsche Boxster is not a 911, but it’s so damn good and so much cheaper, there really is no Porsche that offers a better value. What do you need to know before you buy a Porsche Boxster? Don’t worry, we’ll tell you everything right here in the Ultimate Buyer’s Guide. The Porsche Boxster came into the fray in the 1990s when Porsche decided they needed to make a few more bucks. Their solution: Offer a lower-priced entry-level Porsche. That car was the Boxster, and while back then it was definitely a compromise over the 911, the new one is now its own distinct performance offering. We’re not going to tell you the Boxster is a better buy than the 911. One peek at the power figures and you know which one’s faster. Still, the Boxster reminds us that outright speed is not always proportional to Fahr Vergnuegen. Sometimes a well-balanced chassis and a low curb weight can make a slower car just as fun to drive. The Boxster is one of the purest modern sports car experiences, putting balance ahead of pure raw power. That isn’t to say the Boxster is slow, but drag racing a Boxster is like putting wagyu beef in your chili. This is a a car made for Alpine roads as curvy as the script on the Boxster badge on the beautiful convertible’s hind quarters, which means it’s more than capable enough for that one road behind the Safeway with two 80-degree kinks. To understand what the Boxster is like to drive you’ve got to look into the car’s DNA. The engine in this Porsche is a flat-six pushed as close to the center of the car as possible and as low to the ground as the gods of car physics and packaging will allow. Unlike your typical front-engined, RWD cars, you’ve got plenty of grip at high speeds. This means you’re not fighting the car to keep it pointed in the direction you want to go as much as fighting your own will to live as the car beckons you to go faster and faster. Around some Central Virginia back roads where most cars would give out we found the car pushing us to be dumber and dumber. Power delivery, too, is aided by a flat-six that brings power on early and builds predictably, leaving you with plenty of juice if you know where to shift. Oh, and shift you will, as every Boxster is available with a Cripps crisp gearbox. The Boxster was all-new for 2013 after its unveiling in Geneva in 2012. It brought more Carrera GT-like styling, larger overall dimensions than the outgoing model, more chassis stiffness and more use of weight-saving aluminum. The 6-speed manual, 7-speed PDK automatic and flat-six engines were similar to the outgoing model’s, but the Germans in Stuttgart made tweaks for better performance and efficiency. 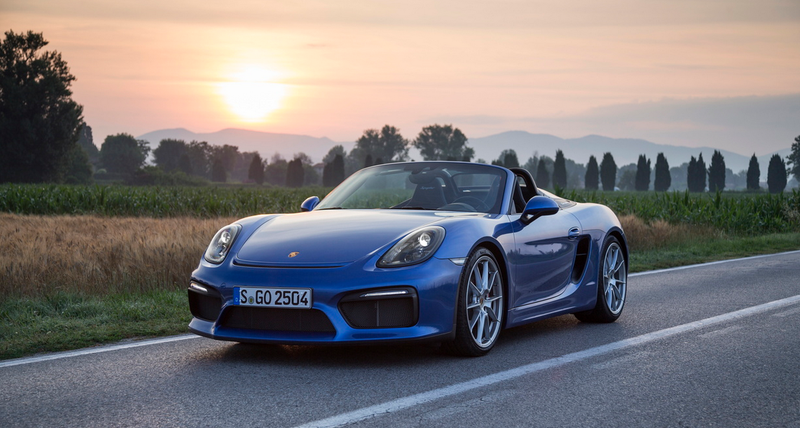 Changes for 2014 were few, but 2015 brought the new GTS trim, which is a higher performance version of the Boxster S, using the same 3.4-liter flat-six but adds 15 ponies, unique wheels, a sport exhaust, unique sport seats, blacked-out headlights and Porsche’s active damping system. The latest model year also sees park sensors and a rearview camera become standard across the Boxster range. Do you want a 6-speed manual transmission and a flat-six engine? If so, great news! Because all Boxsters come with flat-sixes, and all trims can be had with a stick. The available flat-six engines are: a 2.7-liter, a 3.4-liter and a 3.8-liter. They crank out 265, 315-330 and 375 horsepower, respectively. These are solid numbers for a 3,000 pound car, and will get you to 60 anywhere between 5.5 and 4.3 seconds. No, it’s not a 911 Turbo, but it’s quick. And with the great chassis underneath your feat, you’ll have tons of fun canyon carving even if you are a couple hundred horsepower shy of Porsche’s top-dog 911. There’s really not much to talk about on the fuel economy front; the Boxster’s numbers are nothing special. The car only weighs 3,000 pounds, but even with the small 2.7-liter six, you’ll only muster 26 MPG combined with the automatic. From there, numbers get worse as you opt for the bigger engines and especially if you choose the manual. Once you get to the 3.8-liter Boxster Spyder, all thoughts of fuel economy go out the window. 20 MPG combined, folks. That’s not a large distance to travel on a gallon of the good stuff. But this is a sports car, so fuel economy takes the back seat to performance, and in that regard, Porsche’s got it covered. The base Boxster gets four piston calipers front and rear clamping 12.4 and 11.8-inch vented rotors, respectively. The Boxster S and GTS gets the same calipers and the same rear discs, but fronts increase to 13-inches. The 375-horsepower Spyder gets some bigger pizzas to scrub off speed: 13.4-inch discs in front clamped by six piston calipers and 13-inchers in the rear, clamped by four piston calipers. The main Boxster trim levels are: Boxster, Boxster S, GTS, and Spyder, though there is a special Black Edition available this year as well. Boxster: Starts at $52,100. Notable standard features: 2.7-liter flat-six, 6-speed manual transmission, auto start/stop, single exhaust, 18” alloy wheels up front with 235mm summer performance tires, 18” alloy wheels in the rear with 265mm summer performance tires, tire patch kit, electric park brake, automatic rear spoiler, heated power mirrors, power windows, 4-speaker audio system with 7-inch touchscreen and Bluetooth, projector beam headlights, 4.6-inch TFT display for instrument cluster, front and side airbags, automatic climate control, partial leather sports seats. Notable options: 7-speed dual-clutch automatic transmission ($3,200); Sport Suspension: stiffer springs and dampers, unique sway bars, 20mm lower ride height ($1,235); Porsche Active Suspension Management-PASM: electronically controlled dampers with manual settings, 10mm lower ride height ($1,790); Porsche Torque Vectoring: mechanical diff lock and brake-controlled torque control ($1,320+sport suspension or PASM); Carbon Ceramic brakes with 6-piston front calipers and 4-piston rears ($7,400); Sport exhaust system ($2,890); Sport Chrono Package: Dynamic transmission mounts, stopwatch on dash, SPORT PLUS button for throttle response, additional steering wheel display, launch control on PDK models ($1,850); Premium Package Plus: Bi-Xenon headlights, automatic dimming mirrors with rain sensor, heated and vented seats, proximity keyless entry, 18-way adjustable seats with memory setting for seats, wipers, climate control, lights, and more ($3,620). Boxster Black Edition: Starts at $59,100. Notable standard features over Boxster: black exterior finish, unique exterior trim, 20” unique wheels, black partial-leather interior, heated seats, two-zone automatic climate control, automatically dimming mirrors with rain sensor, Sound Package Plus, Porsche Communication Management, unique steering wheel. Same options as Cayman minus Premium Package Plus. Boxster S: Starts at $63,900. Notable standard features over Boxster: 3.4-liter flat-six, 19-inch wheels, bigger front brakes, rain sensing wipers, 9-speaker audio system, Xenon headlights with automatic leveling. Notable options: Same as Cayman, except Premium Package Plus does not add already-existing Xenon headlights ($2,950). Boxster GTS: Starts at $74,600. Notable standard features over Boxster S: 20” alloy wheels, 330 horsepower 3.4-liter flat-six, selectable sport exhaust, unique wheels, Spork Chrono Package, unique sport seats, blacked-out headlights and Porsche’s active damping system. Notable options: 7-speed PDK automatic transmission ($3,960); Porsche Torque Vectoring with locking rear diff ($1,320); Carbon Ceramic brakes ($7,400). Here’s how you buy a non-racing Porsche: Find the GTS trim, don’t add anything to it, and thank your lucky stars you live in the 21st century. With the 3.4-liter flat-six and option manual transmission the GTS is a race car you can afford to drive every day, taking all the options you’d put on a Boxster S and leaving nothing else. In that way it’s almost a value.